We are excited to embark on our 25th year with our name change: from Anonymous to Animals Now. Animals Now works to establish policies which are considerate to animals, and we hired a professional lobbying firm. Our representatives participate in Knesset (Israeli Parliament) discussions and present information to Knesset members and government officials, pushing for proposed bills and political measures to improve animal protection, and blocking actions which might harm them. We work in cooperation with our partners at Let the Animals Live. The bill for the gradual ending of live transports proposed by MK Miki Zohar (Likud Party) has been approved in a preliminary reading. Similar bills were submitted by Knesset members Nurit Koren, Tamar Zandberg, Yael Garman, Meirav Michaeli and Yael Cohen Paran. Animals Now activists further appealed to Knesset members and cabinet ministers and held demonstrations outside the home of Finance Minister Moshe Kahlon, and over the summer, the Ministerial Committee For Legislation passed the bill of MK Zohar. Minister of Agriculture Uri Ariel appealed the decision, but the government decided to reject his appeal and uphold the bill. Of course, we will continue the campaign until the legislative process is complete. We publicized extensive media coverage on the issue across multiple platforms. After footage from live export vessel traveling from Australia to the Middle East was aired on prime-time news, Prime Minister Benjamin Netanyahu's wife Sara posted a video expressing her support for the campaign. A survey shows that 86% of Israelis support the bill for ending live transports, 91% see the live transports as constituting animal abuse, and 90% believe the live transports are in violation of the Animal Protection Act. We initiated a petition signed by 245 lawyers calling for an end to live transports due to violation of the Animal Protection Act. It was signed by some of Israel’s most eminent lawyers. We initiated a public statement calling for an end to live transports that was issued by 60 rabbis, including Chief Rabbinate Council members Rabbi Yehuda Deri, Rabbi Ratzon Arusi and Rabbi Shimon Elitov, and Israel Prize recipients Prof. Daniel Sperber, Rabbi Prof. Avraham Steinberg and Rabbi Eli Sadan. We ran a billboard campaign in cooperation with our friends at Animals Australia, which displayed gruesome photos of live transports in the streets of Tel Aviv and Jerusalem. We brought the masses to the streets for a giant demonstration of 3,000 citizens, Knesset members and celebrities, and have been running ongoing awareness activities throughout the year all over Israel. We garnered support in the government and the Knesset to fight the plan to use hundreds of millions of shekels in public funds to build overcrowded cages for hens in the egg industry. We demonstrated outside cabinet meetings and the home of the Minister of Finance Moshe Kahlon; we gathered 10,000 signatures for the petition and ultimately, the plan was removed. The Ministry of Agriculture is still trying to move it forward, but we plan on fighting back to prevent the use of public funds for animal abuse. We protested internal procedures within the Ministry of Agriculture, which is trying to pass the plan under the public radar, and we are employing additional legal and political procedures in partnership with Let the Animals Live and the Clinic for Environmental Justice and Protection of Animal Rights at Tel Aviv University. Animal Protection Act: When the government committee renewed discussions regarding the jurisdiction over the Animal Protection Act, we sent in extensive information on deficient implementation of Resolution 833, whose enforcement needs to be improved, and we demanded the transfer of responsibilities for enforcing the Animal Protection Act from the Ministry of Agriculture and their consolidation under the Ministry of Environmental Protection. Vegan Celebration at the Knesset: Animals Now initiated a vegan celebration for Animal Rights Day together with MK Tamar Zandberg and food journalist Ori Shavit. Exposing the Fish Industry: The central project of the Animals Now undercover investigations team. For the first time ever, a groundbreaking investigation exposed what has been happening at two of Israel’s largest fish farms and the “Dagat Haaretz” factory. The disturbing discoveries were broadcastby a major TV news edition, and we produced a video clip starring Miki Haimovich as well as a new media campaign that reached about 1 million views. Following our investigation, a probe was launched by the Agriculture Ministry's Central Enforcement and Investigation Unit on suspicion of violations of the Animal Protection Act. We exposed footage from the quarantine station at Kibbutz Eilot, which documents horrific abuse of calves which were imported in live transports. Due to the severity of the evidence, we called for the Ministry of Agriculture to shut down the Eilot quarantine. An Animals Now investigator launched a widespread investigation into battery cages in India’s egg industry in cooperation with PETA India. The footage was used for campaigning and for a comprehensive report that was sent to Indian officials and used for legal and political proceedings. The Animals Now investigative team collaborated with Sentient in a joint project, and published unique footage of the last days in the coop from the hen’s perspective on Ynet news portal. A historical ruling was made this year following an Animals Now undercover investigation into the Tnuva slaughterhouse: for the first time in history, slaughterhouse managers were charged with animal abuse. A serious indictment was made against Kibbutz Geva following an Animals Now investigation that exposed abuse of sheep at a pen which sells milk to Tnuva (one of Israel’s biggest dairy brands). Animals Now’s media team ran over 150 press stories across all platforms - from news editions to magazines and local newspapers. Our social media team edited 140 video clips which were distributed across social networks. The Animals Now Hebrew Facebook page reached an audience of 61 million views and 36 million users. Our long-running recipe and restaurant website, “The Israeli Vegetarian and Vegan Website”, was visited by 1,100,939 people who browsed a total of 3,382,530 pages. On average, 5,917 people visit our websites every day. Over 150,000 people participated in Challenge 22+ this year! Since its launch, over 250,000 people around the world have signed up for Challenge 22+. The international challenge is expanding to local branches: We launched the US challenge in March, and in December, we launched the UK challenge. We launched a unique consultation program to help vegan organizations develop local challenges, and we have already guided and trained Taiwanese and Romanian activist groups to start local challenges in Taiwan (in Mandarin) and Romania. We also helped launch a challenge in Norway, based on the Danish challenge we guided last year, and we are in the process of collaborating with other groups from around the world. Marches and Conferences: Our representatives participated in the world’s largest animal rights conference in Los Angeles; SoCal VegFest, the biggest vegan festival in the United States; and mega-marches in London, Toronto, Reykjavik, Los Angeles and New York. The Animals Now Humane Education team gave 380 lectures and workshops to 20,000 youths and adults around the country, in Hebrew and in Arabic. We held 10 lectures and workshops for education students and school teaching staffs, reaching around 500 educators across the country. Additionally, for the first time ever, Animals Now taught 10 training courses to teachers and social coordinators in the Ministry of Education, as part of a joint project with the Ministry of Environmental Protection and NOAH - The Israeli Federation of Animal Protection Societies. 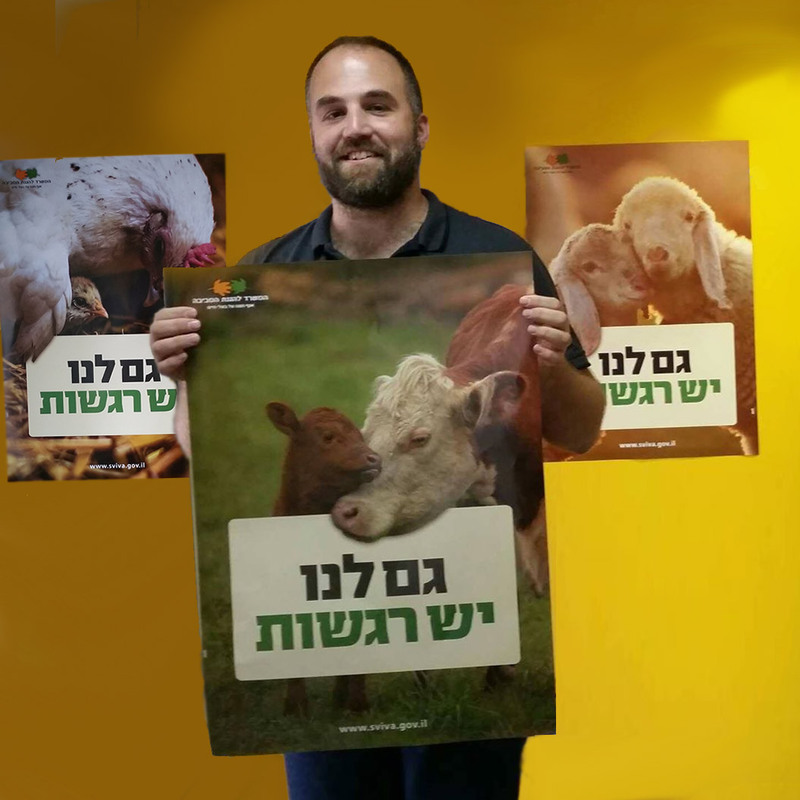 In a joint venture with Animals Now, the Ministry of Environmental Protection produced and distributed thousands of posters with images of cows and calves, chickens and chicks, and sheep and lambs, with the inscription "We have feelings too" to Israeli schools. The posters were also distributed by Animals Now and the Ministry of Education. In preparation for Animal Rights Day in the education system, thousands of teachers watched the lesson plans we shared on social media, and over 100 of them reported back to us that with the help of Animals Now, they observed the day at their schools with classes, lectures, recess activities and volunteering field trips. Our lesson plan website “Live Act” reached a monthly average of 3400 users! Hundreds of new teachers signed up for our monthly magazine for educators this year. Around 70 educators, including supervisors and teaching instructors from the Ministry of Education, attended our second annual summer teachers conference, “From Compassion to Action”. Our Humane Education team also participated and distributed educational materials at several Ministry of Education conferences. We translated our lesson plan workbook, “Sharing the World”, into Arabic, and it’s now being distributed to teachers in Arabic-language schools across the country. The Animals Now grassroots team organizes an average of 10 outdoor activities per week, and over the course of 2018 we organized 569 activities across the country. In the past six months alone, 3,261 people stated a willingness to change their consumption habits at our advocacy activities, and 1,273 even signed up for Challenge 22+ at our advocacy activities over the course of this year. Our student groups held over 80 activities at universities and colleges. Animals Now is operating 10 city-wide groups: Tel Aviv, Jerusalem, Kfar Saba, Beer Sheva, Haifa, Petah Tikva, Ashdod, Hadera, Afula and the Krayot. We developed new successful activity formats: “Choosing a Side” and “Masks of Truth”, which help us show the realities that animals face in the streets and start a conversation; “Veganism on the Way” - spreading messages that encourage compassion for animals with sidewalk illustrations and captions; and “Tools of the Trade” which shows tools used to harm farm animals (like electric prods) to pedestrians. We organized two countrywide days of activity at dozens of sites - one about live transports, and another on the dairy industry Shavuot, a Jewish holiday on which it is customary to consume dairy products. We organized large-scale vegan picnics in Tel Aviv, Jerusalem, Haifa and Petah Tikva, attended by hundreds of people - among whom were non-vegetarians. This served two goals: exposing non-vegetarians and new vegans to plant-based foods, and forming connections that will help them stick to veganism and motivate them to get involved in activism. We invested in training programs to help activists become more professional and work more effectively - a Passover seminar, a Hanukkah Seminar and the Activegan course for effective activism (in Tel Aviv, Jerusalem and Beer Sheva). Additionally, we have continued to update and distribute articles and tips on effective advocacy to our activists with the Activegan website. And many more activities: we held a huge demonstration against the fish industry in the blazing August sun; we joined environmental organizations at Israel’s Climate March with a special presentation on the environmental damage caused by the meat industry; we spread out to three locations simultaneously at Tel Aviv’s annual White Night event; and we participated in Pride Parades in four different cities.